On Monday, I received my Lilly Pulitzer catalog... I picked out my favorites, turned the pages, and filed the magazine away for later. On Tuesday, I received an invitation for a Lilly event at the Markel dealership in Omaha. 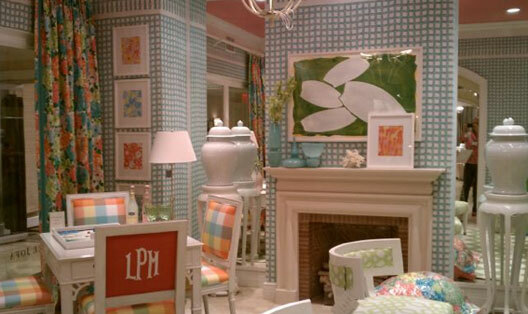 Mimi, a family friend was hosting a Lilly Trunk Show on Thursday. This was an easy RSVP... y.e.s. On Wednesday, my friend Alex posted a photo on my Facebook wall of Lilly's launch in the Big Apple at the Lee Jofa showroom... I couldn't wait to read what that was all about... when I had 5 minutes. Thursday, as I was perusing my favorite blogs, a Lilly photo caught my eye. It didn't take me long to realize it was the same print I had seen on Facebook the day before. I hadn't realized yet that Lilly Pulitzer unveiled its new collection of fabrics for Lee Jofa for design bloggers in NYC at the very BLOGFEST event I had been fretting about not getting into! (I was too late signing up, and was put on a wait list never to be thought of again...) Sure enough, Pretty Pink Tulips posted Lilly Brings Sunshine to Blogfest featuring the very same Lilly prints! Thursday afternoon, I attended the Lilly trunk show in Omaha and visited with my friend Mimi. Her store, Under the Palm Tree, is in Overland Park, Kansas, and Omaha was lucky enough to have their beautiful Lilly merchandise available for a terrific trunk show and a wildly successful cocktail party/fashion show. 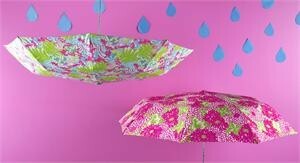 Visit her Lilly Pulitzer Via Shop! I absolutely hate Lilly for me, but for everyone else it rules. A colour feast for summer!!! I wouldn't know what to choose. Looks like you had a load of fun. OMG! It's like lilly-land! Does heaven look like this? Shoot! Now I wish I had attended the trunk show!! Oooh, la Lilly! Your pics are so colorful and perky. Have you seen the Lilly Pulitzer cookies? They are her version of Barnum's Animal Crackers...so cute! It was one of the first postings I did. I love Lilly!